New remodel in Winter 2019 including all new kitchen cabinets and granite countertops. Check back for new photos coming in March. Also new flooring and carpeting throughout house and new tub and shower in downstairs bath. Tall Oaks Bay is A lovely 2200 plus sq.ft. home on an acre of oak trees on Jonathon Creek which is part of Kentucky Lake. 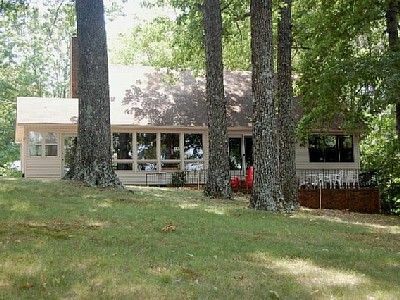 Four large bedrooms and two large baths completely furnished home with spacious living room with fireplace and wall of windows overlooking the Jonathon Creek area of Kentucky Lake. Enclosed sunroom overlooks the lake. Basement level has extra TV and living area as well as game tables. Just steps to the lake and dock with patio overlooking the lake. We are located in Western Kentucky. We are just 10 miles form The Land Between the Lakes National Recreation Area. LBL offers 170,000 acres of rolling hills, oak forests and 300 miles of undeveloped shoreline wrapped by nearly a quarter million acres of water. Amenities include: Fishing and Boat dock, large patio overlooking the lake, outside propane grill, ceiling fans, air conditioning, washer, dryer, dish washer, TV, VCR, cable, FREE INTERNET, fully equipped kitchen, all bed linens and towel Master bedroom has canapé queen size bed, second bedroom fun fish theme with queen size bed, third bedroom has 2 twin beds and a double bed and fourth bedroom has twin bed and double bed and is very large, Excellent free boat ramp within ten minutes, great fishing, water sports, and outdoor recreation area. Circle driveway with parking for several cars, trailers and boats. Houes at the end of the road is very private with no traffic. Activies in the area include, 3 state parks, Kentucky Dam, Kentucky Opry, Players Casino, Golf, Horseback riding, National Quilters Museum, Outlet Mall, Antiqueing, Crafts, Local Festivals, National Boy Scout Museum and Beachaven Winery. Mike is a financial services representative and Nancy is a registered nurse. We love the lakes area. We have 3 daughters and 6 grandchildren and they all love water sports and nature. Our home has been a great place to spend some time together. We have been renting our homes to travelers for over 25 years. We have been visiting the Lakes area for over 30 years. This is our second home on Kentucky Lake. We love the area because it is quiet with great fishing. We can just sit on the patio and watch the sun set or Great Blue Herons land or our dock. It has year around water at the dock. Our home is close to the Land Beteen the Lakes Recreation Area. You can golf at Kentucky Dam State Park or at Boots Randolf Golf Course in Barkely Dam State Park. We are on a quiet part of the lake and a quiet neighborhood. We have the best location for sunsets. The view across the lake is all forest. Located on Jonathon Creek which is eight miles long and a mile wide. Our dock is a short walk from the patio and is 20 foot long covered dock. Plenty of wood in the yard if you chose to gather it. Salt, pepper, spices, coffee filters, garbage bags,flour, misc. dishes for 10, silverware for 10 or more. Many pots and pans, cast iron and other. 180 Degree view of the lake. Covered dock on the property with boat public boat ramp near by.